Welsh flyweight Andrew Selby is certain he will be ready for a shot at a world title after just 10 professional bouts. "The more I fight the better I perform so hopefully I'll be out again in December," he told Channel 5. "Hopefully I can break records - win a British title, then maybe go for a European or world title straight away. "It's very realistic, that's the plan. After 10 fights I want to go for a world title." Selby's older brother, Lee, fought 21 times before getting a world title shot, beating Evgeny Gradovich in May this year to claim the IBF world featherweight title. Wales' 12th world champion was in the crowd in Bristol as his brother looked a class apart by overwhelming 18-year-old Ajtai, who arrived with a 10-fight unbeaten record. 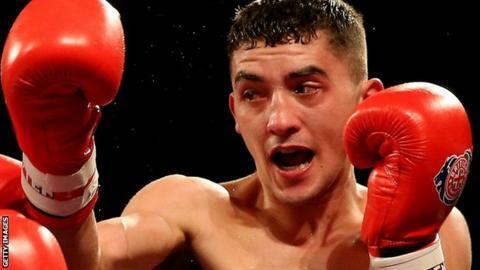 The referee spared the teenager from any more punishment towards the end of the second round as Selby landed with a succession of heavy combinations and faced nothing in return. "I thought we was going to come steaming in at me because he was a smaller guy but as soon as I landed a jab he knew I was too strong for him," said Selby, who is already ranked the fourth best British flyweight. "He went on the back foot and wasn't throwing any punches." With two European Championship gold medals (2011 and 2013) and a silver medal at the 2011 World Championships, Selby is classed as Wales' most successful amateur boxer. He can also boast an unbeaten 10-fight record in the World Series of Boxing, a professional competition open to amateurs, and is convinced he is destined to be a world champion. "I think I can do it," he said. "I think I've got all the talent in the world. I've just got to keep the dedication and train hard."